This is a guest post by Marcus. If you'd like to guest post on this site, click here to read the guidelines. Back in early January 2018 I injured my shoulders in the gym. It was nothing very serious and didn’t require surgery, but it was still quite painful. I got neck and shoulder pain from sitting at a computer, and anything that required a bit of muscle contraction around my shoulders triggered sharp pain. I basically couldn’t lift anything heavy overhead or sleep on my side for 6+ months. I kind of like using a computer and going to the gym, so this was a real bummer for me. But as any reasonable and solution-orientated individual I quickly started to figure out a solution. In that process, I learned a great deal about posture and ergonomics, and that I had given it way too little consideration in the past. I realized that my injury was probably due to my laptop use and the poor upper body posture I had gotten as a result of that. At my previous job, I was given a laptop to work with. It was a small and relatively young company that didn’t have too many resources. On the positive side, I got the chance to get some interesting experience that you probably only can get as a newly graduated employee in a small company like that. When I got home, I was also working on a laptop, doing all the things you do on a computer and also writing content for my website. Just before getting that job, I had written my master’s thesis on my laptop which was also very work-intensive. In short, I had used my laptop computer for many hours on a daily basis for about 2.5 years. This is how I would spend most of my time working. Ergonomics is the multi-disciplinary study and process of designing and arranging the environment and tools we use to increase our productivity, safety, and comfort. You can read more about ergonomics on Wikipedia. A lot of research, work, and effort has been made into designing the “normal work desk setup” using desktop computers and such. Because in doing so work-related ailments and injuries could be greatly reduced and a lot of money saved. Time spent interacting with portable devices has skyrocketed, and less people are working from a permanent desk. Ergonomics have just not been a big part of the design process of these devices. It is a big problem because when people use them they are often in awkward and compromising positions. Research has been able to confirm that using mobile devices can be a big issue. A study from Harvard School of Public Health, Brigham and Women’s Hospital, and Microsoft found that bending the neck to look and operate mobile devices could lead to neck and shoulder pain. For further reading about the issue, you can check out Spine-health.com. The major issue with laptops is the relationship between the position of the keyboard, screen and the user. Unless you use external accessories, you are going to be hunching over that laptop in a bad way! It is actually such a big problem that some experts have made an acronym when referring to it: HOL-syndrome (Hunched Over Laptop). Not only does this hunching over develop a Mr. Burns from the Simpsons kind of posture, but it also puts a lot of unnecessary strain on your shoulders, neck, and spine. Given enough time in that position and you will get stiffness and pain in your shoulders and neck and you put your spine at risk. Of course, this kind of posture is also not very attractive, you increase the risk of injury, and there is even a good amount of evidence suggesting that it can influence your mental health negatively. Furthermore, the laptop screen is bit small and the keyboard on the laptop is crammed and the trackpad is in the way. Ergonomically speaking, there is really not much good to be said about the laptop design. Maybe you were already fully aware of this, but if you are using a tablet or phone a lot, are you perhaps making the same kind of mistake? Because it is almost the same thing that applies for mobile devices, that is hunching over a.k.a. iHunch. As I just mentioned above, the main issue with using a laptop is that you are hunching over most of the time. The best solution is probably to get a docking station and a large external monitor, but that would take up a lot of my space. 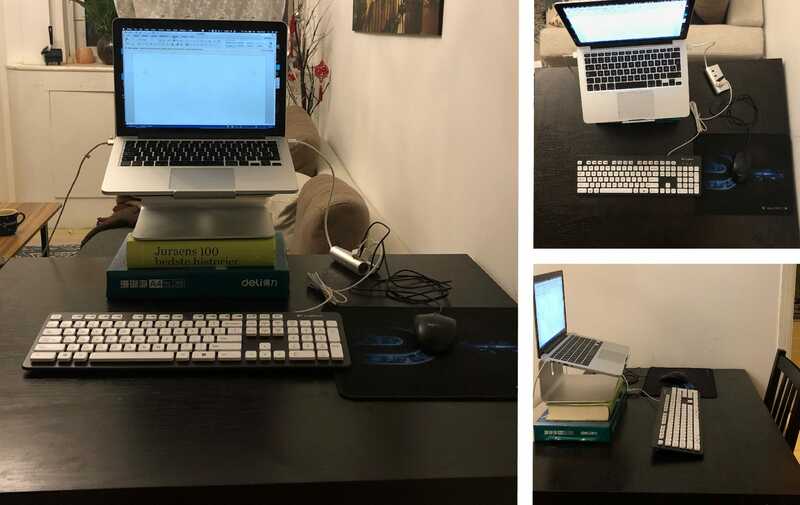 Besides that, the laptop stand (this article highlights one from Perch) works well for me and my eyes are quite good so I have no issue using a smaller monitor. The keyboard and mouse I got were just some basic models from Logitech (K310 + M100r). I got the laptop stand from a local online store, but it is almost completely identical and in the same price range as the laptop stand: Rain Design mStand Laptop Stand in silver which is very popular on Amazon. How to stay healthy in the office with ergonomics is emphasized in this article. Underneath the stand, I put a stack of printer paper and a book to raise the screen even higher. This works well for me and requires little space. I also found that sitting on a hard pillow gives me just the right height to maintain about a 90 degrees angle at my knees, hips, and elbows. Together with the exercises I mention below, I have been able to completely resolve my shoulder and neck pain. Please note that this setup is as at my home. I haven’t had a “real” office for a while because in 2018 I went back to university to study. I was lucky enough to get a sponsorship for further studies. If you can consider improving desk ergonomics as eliminating the cause of your issues, then doing these exercises are like treating the symptoms. Essentially, by doing various exercises you reverse the effects that the poor ergonomics have had on your body. Hunching over creates an imbalance between the muscles in your upper body. It weakens and overstretches the upper back while your chest becomes tight. The same idea applies for your neck, although the muscles involved have a bit more complicated relationship. What you need to achieve is to stretch the tight muscle tissue and strengthen the weak muscle tissue. To do a chest stretch in a doorway or a wall corner, simply form about a 90 degrees angle with arm and elbow, put it in the doorway / wall corner and gently lean into it. Stretch each side for 30-60 seconds 1-3 times. For this one you need a resistance band or a cable machine. Grab the resistance band with straight arms in front at about shoulder width. Your grip should be so your thumbs are pointing towards each other. Now pull the band with straight arms as if you want to pull the band apart. Pull until it reaches your chest and your arms are pointing each side while externally rotating your shoulders. Here your thumbs should be pointing backward. Do anywhere from 15-30 reps for 3-5 sets. The trick is to use a light resistance and a lot of reps since that will provide a better stimulus. These are great because they both strengthen and stretch the right muscles at the same time. You can do them while standing or sitting. For a more advanced version, you can stand glued to the wall while doing it. Place a finger at your chin for a point of reference (don’t move the finger), then pull the head and your chin straight back and hold for 5 seconds. You should feel a good stretch in your neck and there should be some distance between the chin and your finger. When the 5 seconds are up you move the head and repeat for 8-12 reps and 3-5 sets. 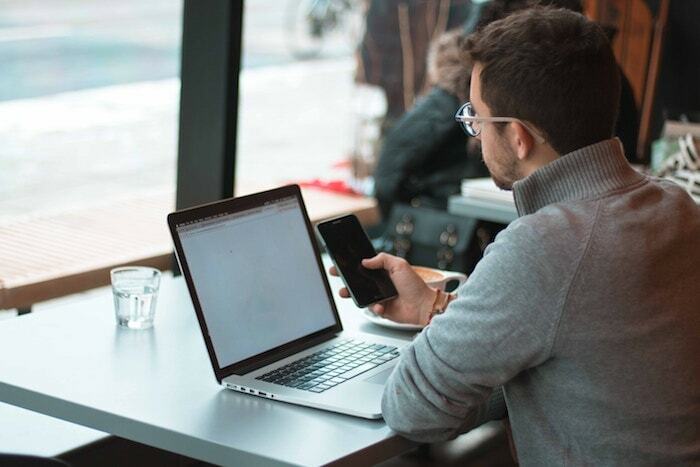 Experts agree that poor posture is an issue on an epidemic scale and it is especially the interaction with mobile devices and our sedentary lifestyle in general that are the big culprits. One simplified yet insightful way to view posture is that it is simply a reflection of the kinds of the positions you put your body in most of the time. Spend most of your time at a poor desk setup or work environment and your body posture will over time adapt potentially giving rise to a large number of issues. It might not be a problem right now or in the next 5-10 years, but it can come back to haunt you later. Marcus runs the site Strengthery.com where he likes to write about weight training, weight loss, and health-related topics. After a painful shoulder injury and realizing his posture sucked, he became obsessed with learning everything he could about how to improve and maintain good posture and now likes to share what he learned. Hi, the tips you have provided on how to get rid of shoulder and neck pain by making some adjustments in environment are very helpful. Thanks and keep sharing! This was a guest article by Marcus who provided some very thorough info on relieving shoulder and neck pain on a very personal level. I appreciate your comments.